Obesity Surgery: Procedures and Aftermath | PrimeYours! Every since culture decided to worship at the altar of thinness, eschewing the rounder, softer indications of wealth and success of previous generations, us crazy humans have turned to some pretty crazy methods to shrink down to the desired size. As medicine and technology have progressed in the past century, we have increasingly looked to science to help us in our quest to lose weight keep it off. This has resulted in a multi-billion dollar weight-loss industry touting all sorts of pseudo-scientific fad diets, pills, and medical procedures. Surgical intervention started in the 1940s when the first attempts at tummy tucks raised the hope of the slim-seeking elite who could afford such ventures. Tummy tucks led to liposuction, the earlier attempts effective in reducing fat, but not as effective in retaining a natural shape to the body. It was a little more hit and miss back then. Liposuction is still a fairly common procedure for small amounts of weight, but the new heights of obesity statistics that continue to plague our population (and tax our medical system) have given birth to a new type of weight-loss surgery that doesn’t involve sucking out bags of fat from underneath the skin’s surface. Bariatric surgery is the term used to describe surgery performed on a person whose weight is such that is creates (or has the potential to create) serious life-threatening conditions. Bariatric surgery is not to be considered by people who simply want to lose a few pounds. In order to qualify, responsible doctors will perform these types of surgery on a man who is overweight by 100 pounds or more or a woman who is overweight by 80 pounds or more. If you are a man who is 80 pounds overweight or more and you have a life-threatening condition that is caused by the excess weight (e.g. type 2 diabetes, heart disease, severe sleep apnea), then you may also be considered a candidate. There are two types of bariatric surgery (and several procedures using those two types). The first are restrictive procedures in which the size of your stomach is surgically reduced in order to reduce the amount of food you can consume. The second type of procedure is a combination of restrictive and malabsorptive. This means that, along with the reduction of stomach size, a bypass is created so that the amount of nutrients and calories, which would normally be absorbed by the small intestine, is reduced. Restrictive surgeries can include banding, stapling, or gastrectomy (although this last is less common). The most common procedure uses a band that is placed around the stomach, reducing the capacity by up to 90%. Because space is so restricted in your stomach, it is actually physically impossible for you to overeat without experiencing symptoms such as stomach pains and vomiting. The hope is that it conditions the patient to learn how to eat smaller portions so new eating behaviour is fostered. 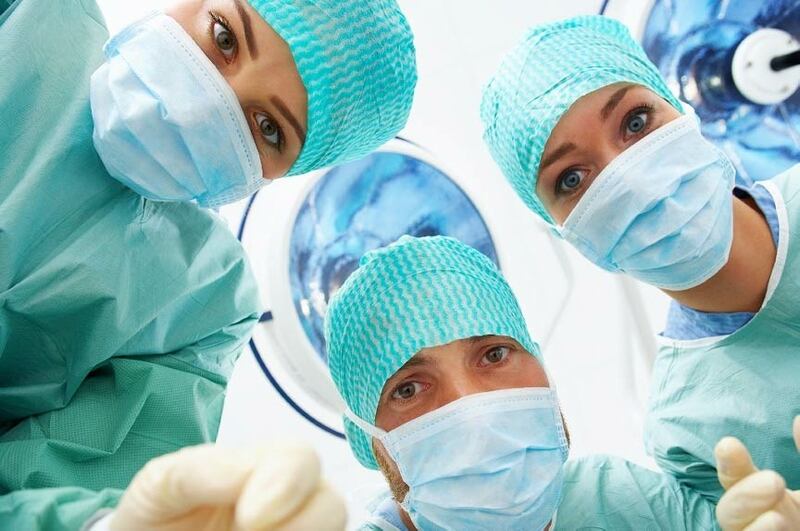 While some surgeons are still performing major surgery to attach the band, it can be done using a laparoscopic procedure, which involves making small incisions through which the surgeon passes a camera to observe his or her work. The benefits of the laparoscopy are smaller scars and shorter recovery time. The risk is that it is precise work that requires an experienced surgeon. The second type of procedure, the malabsorptive, is most commonly performed as a gastric bypass in which food that is digested bypasses (most commonly) the first part of the small intestine (the duodenum) where calories, and nutrients such as calcium, iron, vitamin B and protein, are absorbed. Health risks of this type of surgery are relatively small, and it can be performed by laparoscopy as well. The most common risks are developing abdominal hernias, gallstones, infection, and nutrient deficiencies. Because the bypass reduces the number of nutrients absorbed, the patient may be required to take nutritional supplements indefinitely. Studies have shown that patients who opt for the combined restrictive and malabsorptive or simply malabsorptive lose more weight than those who coose restrictive alone. Malabsorptive procedures can lead to weight loss of up to 100 to 200 pounds. Restrictive procedures on their own usually result in the loss of some weight, but they do not always get down to “normal” weight for their body type. For both procedures, patients must follow a strict diet and exercise regimen following the surgery. Recent studies have shown that bariatric surgery should not be considered “plastic surgery,” or placed in the same category as procedures such as liposuction. While liposuction does show immediate results, one cannot remove more than 10 pounds of fat at a time, and it does not affect long-term lifestyle habits (like reduced portions) to promote long-term weight loss. These studies (in the United States and Sweden) have indicated that obese patients who underwent bariatric surgery had a 30 to 40 per cent lower risk of dying within 10 years than obese subjects who did not have surgery. There was a reduction of deaths due to diabetes (cut by 92%), cancer (cut by 60%) and heart disease (cut by 52%). Once a formerly obese person has lost a lot of weight, there are other issues that may continue to haunt them. Often, emotional issues come to the fore, as well as other physical hang-ups. A patient may be ecstatic about the mobility they have gained and the improvement to their health, but still may be disappointed with certain aspects of their bodies. It is difficult to carry a large amount of weight around and not have it have long-term effects on various organs and parts of your body. One of the biggest reminders for someone who has lost a great amount of weight is excess skin. Whether or not your skin bounces back depends on several factors, including genetics, age, the length of time you carried the weight, how rapidly you lost the weight, and the amount of exercise you are doing. Many fitness advisors state that it is possible to lose the excess weight through a strict reduction in body fat, but all admit that exercise is not the only factor. If you find that your skin is not bouncing back and it is having an effect on your emotional recovery from the weight loss, consult your doctor about skin removal surgery. This has also come a long way. As with any surgery, there are risks such as blood loss, hematoma (hard, node-like bruises caused by hardened blood) and infection. The disadvantages of the surgery are that it is considered cosmetic and can be very expensive (whereas many health plans are now covering some bariatric procedures), it is complex surgery that requires an experienced surgeon, the surgery and recovery times are long, and there will be scars. After all that you have been through at this point, though, consider those scars badges of honour! The advantages of the skin removal surgery, which can be performed on the abdomen, arms, or thighs, are improved skin quality, longevity of results and natural contours that can help you readjust to your new weight. Bariatric surgery is by no means an easy way out. It will involve a change in lifestyle, in how you relate to food and exercise, and a lot of hard work. You deserve to have a body that you love as much as it loves you—and it will.